Create interactive maps from files, databases, and online sources. Create street level maps with GPS locations. View CAD data and satellite imagery. Use editing when disconnected in the field. Store historical snapshots of data versions. Create spatial data from scanned maps. Publication-quality maps with “atlas-like” quality. Advanced feature manipulation and processing. Data conversion for CAD, raster, and coverage formats. View the 45-page Desktop Functionality Matrix pdf or ArcGIS 10 Functionality Matrix poster. 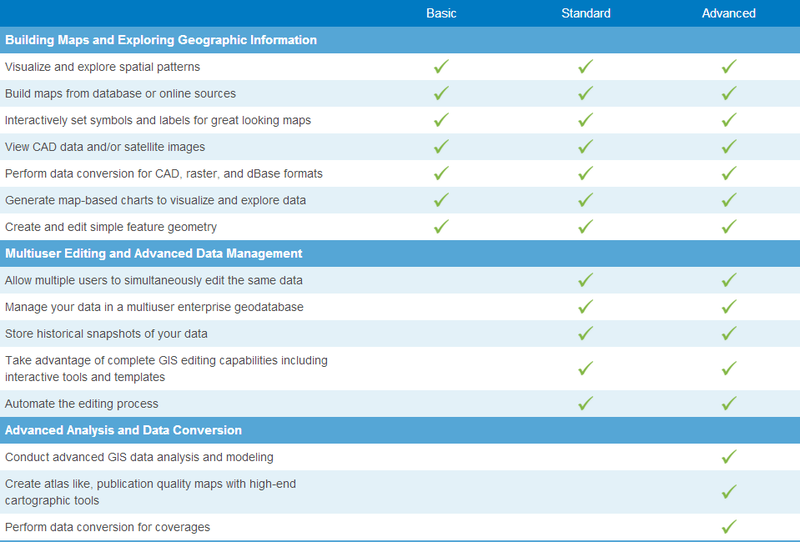 Click the image above for a larger version of the ArcGIS Functionality Matrix to compare the features in each license level. This entry was posted on July 6, 2017 by Tom Bresnahan.